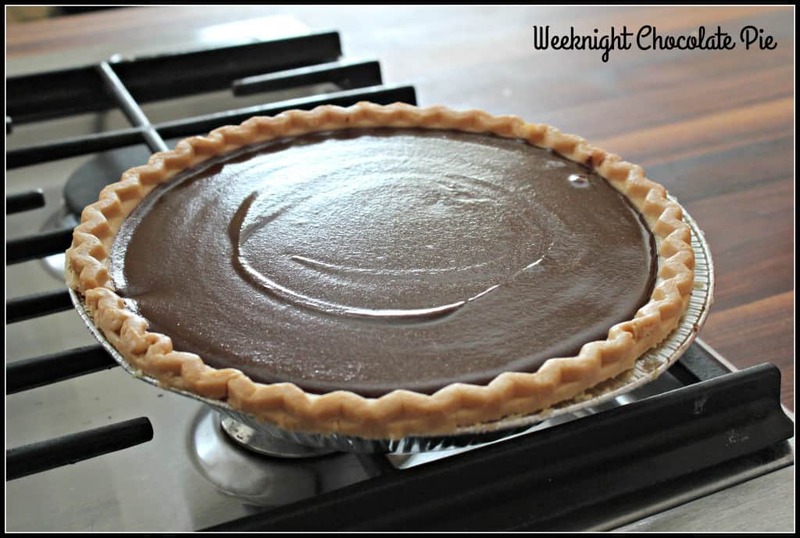 This is called Weeknight Chocolate Pie because it is soooo easy to make you can make it on any day of the week! I saw a recipe that looked very easy on the Pioneer Woman blog and I knew I could modify it to make it work for us. Today, I looked in my fridge and saw that leftovers were piled on top of one another from all the meals I have cooked recently and decided to let dinner handle itself. With a little extra time on my hands, and some half & half in the fridge that needed to be put to good use, why not make Chocolate Pie? Chocolate Pie is basically an amazing, rich, chocolatey pudding poured into your favorite pie crust. I had a frozen, gluten-free pie crust from Whole Foods in my freezer waiting for something healthy like quiche. Alas, I gave it a better life as part of our tasty dessert. 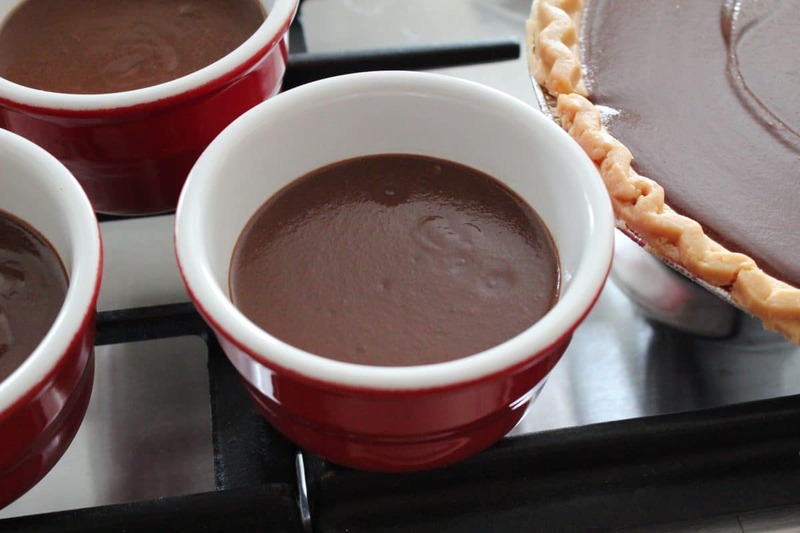 Because chocolate pie is only cooked on the stovetop, your pie crust needs to be precooked. I let my pie crust it thaw on the counter for ten minutes, poked the heck out of the bottom of it, and cooked it at 375 degrees for 15 minutes. That did the trick for me but you need to check your own pie crust directions for the best results… Chocolate cookie crumb pie crust would work great for this as well! Get creative. Chocolate pie needs only a few ingredients … half and half or whole milk, egg yolks, sugar, corn starch and chocolate, of course. 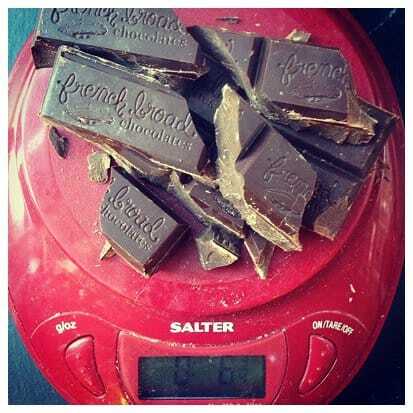 I got an enormous baker’s bar of chocolate from French Broad Chocolates the last time I was in Asheville (yes, they ship!) and I will be super sad to see it gone … I chop off a few sections at a time and it really makes the most amazing chocolate desserts. 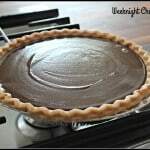 There are a lot of recipes for super simple chocolate pie floating around and they look very similar to this one. The very first chocolate pie recipe I ever used was from the trusted, beat-up red covered Betty Crocker cookbook in my mom’s kitchen. This version isn’t too different from that one… The next time you need a weeknight dessert, you definitely should give this a try. If you have extra custard, pour it into ramekins and chill in the fridge! 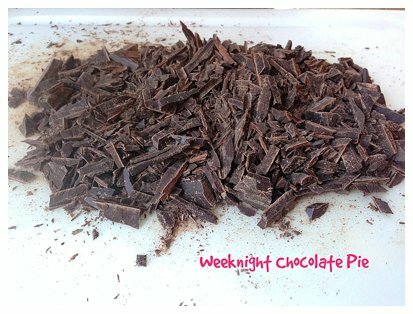 Weeknight Chocolate Pie – Got Extras? Combine dry ingredients - sugar, cornstarch, and salt - in a medium sized saucepan. Whisk together half and half and egg yolks in a medium sized bowl. Add to saucepan. Stir to combine. Heat over medium heat, stirring constantly. Don't let it boil. When the liquid thickens to a custard consistency and you can draw a line down the back of your spoon, remove the custard from the heat. Add the chopped chocolate and the vanilla. Stir well. 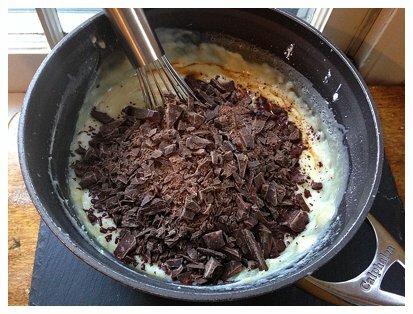 Use a spatula to fold all the chocolate into the custard. Pour the chocolate custard into your prepared pie pan. Pour excess chocolate custard into small ramekins. Cover the pie with plastic wrap and press down evenly over the top of the custard to smooth it out. Chill for at least 3 hours. Serve with fresh whipped cream. Oh I love chocolate pie and I’m always on the search for new recipes! This one sounds great to me. Thanks, Sarah!! I never had chocolate pie until a few years ago – such a tragedy! “Let dinner handle itself”….that’s EXACTLY the thing to do when there are so many leftovers! This looks pretty easy to handle for someone that doesn’t do a lot of pies! I think I could give this one a chance. Looks delicious! Thanks, Julia! I am generally only a pie person around the holidays but this one is SO EASY! I hope you like it! This looks like something my family would love and something I would be able to tackle. Thanks, Michelle! My older daughter even feels confident to make this for us now! I adore chocolate anything, but especially chocolate pie! Love quick & easy chocolate recipes! Thanks, Marlynn! This is definitely quick and easy. Oh I love the idea of a weeknight pie. 🙂 And one can never go wrong with chocolate! Thanks, Kimberly – So true. You cannot go wrong with chocolate!! Looks yummy! I will have to try it! This looks AMAZING and I am lactose intolerant but the higher the % cacao the less lactose… so I will give this a try! Yum! Thanks, Kacey! Good to know!